The author has provided a very readable review of Mark Antony, based on careful research. 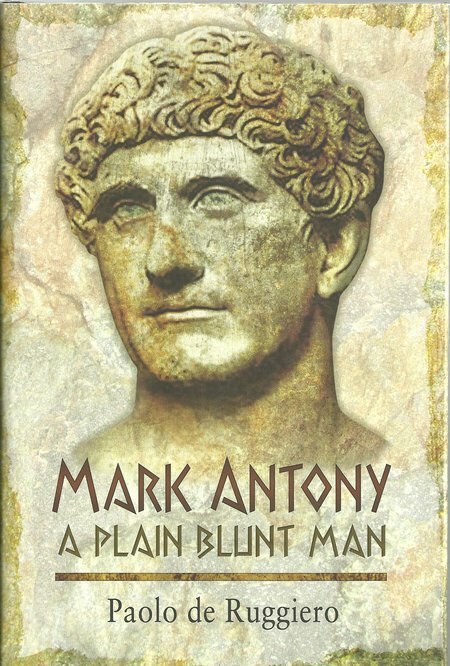 He shows Mark Antony as a pivotal figure with a precise political vision for the Roman world and places him in a fresh perspective. This differs from many previously accepted reviews of Mark Antony but the case is convincingly argued. Undoubtedly, others will take a fresh look in the future and may present a different set of views which is inevitable because of the way that evidence was recorded and presented, mostly by people who supported other Roman factions and were keen to present those they supported in a favourable light. DESCRIPTION: Mark Antony is one of the best remembered Romans and yet in most respects he is one of the least accomplished. He lived in one of the most significant periods in recorded history, at the time of Rome’s move from a republic to an empire and at the birth of a new religion. He was undoubtedly a capable and experienced soldier who served in Judea as a cavalry commander and with distinction in Gaul where he supported his uncle Julius Caesar and was decisive in the defeat of conspirators at Philippi. Mark Antony has acquired many detractors, both in his lifetime and in history. Many write him off as a simple soldier but although he was an experienced and largely successful soldier, he was much more. In another time he could well have become an Emperor of Rome and came from one of the great patrician families. Of course, becoming Emperor was often a bitter sweet success because many a Roman General was propelled by circumstances and his troops into the position, only to then become the target of conspirators, often falling to the assassin. Mark Antony probably only became widely known in history because he survived the assassination of his uncle Julius Caesar and Shakespeare used him to present the obituary moments after his uncle was killed. There have been several theories to explain his escape, but it may have been as simple as the assassins considering him as a potential ally at least in the short term. His relationship with the Egyptian Queen Cleopatra may be another reason why he has survived in history. Several of the senior characters in Ancient Rome took a broadly similar path from the centre stage. When the enemies mobilized in Rome, it was a logical escape route to flee to Greece and then on to Egypt where there was a prospect of bringing together supporters and then taking on the enemies in Rome. In his relationship with Cleopatra, it was as much an affair of state as an affair between a man and a woman. Cleopatra needed a Roman protector as much as Mark Antony needed a base from which to attack his enemies. He has often been portrayed as Cleopatra’s puppet, but that is not backed by the evidence. For anyone beginning to develop an interest in the story of Ancient Rome, this is a very good point to start because it is set at the point where the Republic gave way to the Empire, and also because it is set at the birth of a major new religion that was eventually embraced by Roman Empires and adapted to suit their views of gods and religion. Beyond those cardinal points, the author has produced an elegant account that is easy to read without the need to develop a narrow academic focus that makes so many otherwise good studies impenetrable.